The pale violet pink of the Kunzite it said to heal a broken heart, with its delicate and feminine glow this gemstone is perfect for a touch of glamour. Kunzite is named as a tribute to George F. Kunz, the legendary American mineralogist, who first described the gem in 1902. Kunzite has a strong colour intensity variation when viewed from different directions. 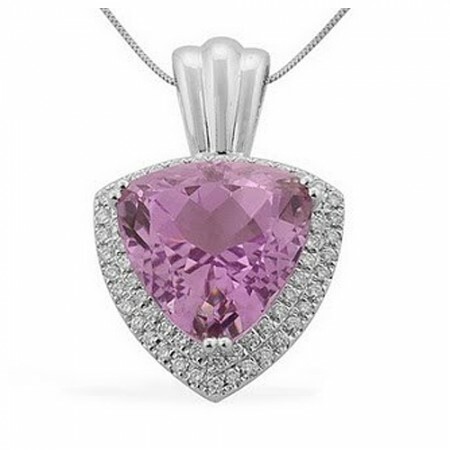 Kunzite is therefore very difficult to cut to ensure that the light passes through the gem and accents the desired colour. Kunzite is said to help one to understand and interact better with others. The largest faceted kunzite is an 880 carat specimen on display at the Smithsonian Institute in Washington D.C. As a soft coloured gemstone, Kunzite shows the best colour in larger sizes. Stones should be at least ten carats to be really in the pink.